We decided that it would be fun to create a "My Poetry Book" this April for National Poetry Month. Every weekday we'll select a poem to paste into my daughter's poetry notebook and, after reading the poem aloud together, my daughter will draw an illustration for the poem. Along the way we'll try to update our readers on the progress and post a few entries. It looks like rainy weather is here to stay for a few days. 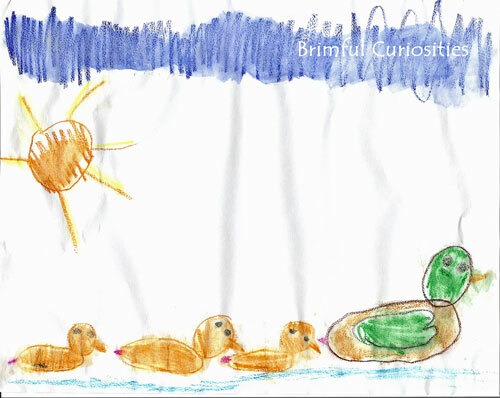 Good weather for ducks and some duck poetry. Additionally, my daughter's preschool teacher brought some duck eggs to school, and my daughter is excitedly waiting for the eggs to hatch. Here's our latest poetry choice. 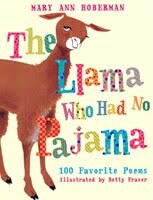 We found this wonderful poem about ducks in The Llama Who Had No Pajama: 100 Favorite Poems by Mary Ann Hoberman, illustrated by Betty Fraser. The poems in the book are perfect for younger readers. The selections feature different animals and other topics of interest to children. My daughter drew a lovely watercolor pencil illustration for her "My Poetry Book" to accompany today's poem. Do you have any favorite duck poems or books? I love the idea of making a poetry book. Your daughter did a great job on the picture! You were the winner of my giveaway. Make sure you drop me an email with your address and information in the next few days so that I can get your book to you. I *love* the drawing of the ducks! Makes me want to find some bread and go to the park right now! Thanks so much for sharing! What a wonderful idea for you and your daughter! I love her drawing!